OK I have failed to do a 12 months calendar for 2011 since Jan is already over but that’s because I didn’t get a reply from the 12 winning images owners, however the wonderful people that have replied deserver to be published and they deserver to have the calendar so the calendar will be online even if it is missing a month! For now I will make available for download the month of February 2011 so you can go ahead and download it hoping that in the next few days I can get all the replies to complete the 11 remaining months of 2011 and I will then publish the whole thing together. 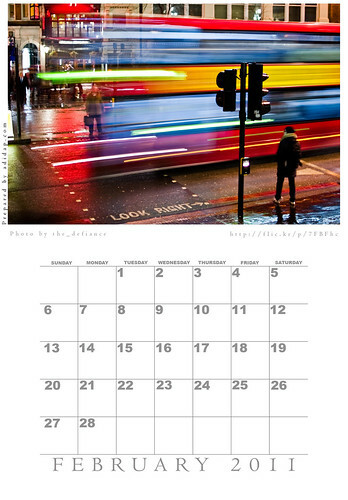 In the mean time you can download and enjoy the Feb 2011 month in both US and UK format! This is really nice ADIDAP Calendar.i will try to use it. Thank you for the calandar. Doesn't matter that it is late a month, it looks fantastic. A short overview of the history of digital cameras, as well as some practical recommendations for choosing one. Calendar Looking Nice. Thank you for the Calendar. High power laser pointers and portable lasers have numerous applications other than pointing. Applications range from astronomy and avian dispersal to ground alignment and defence. The calendar of ADIDAP for 2011 is nice n easy understandable. Every month placed in proper manner. Took me time to study all of the comments, but I truly loved the post. It proved to be really helpful to me and I’m sure to all the commenter s right here! It is always good when you cannot only be informed, but additionally engaged! I am sure you had joy writing this article. I’ve really enjoyed reading your articles. You obviously know what you are talking about! Your site is so easy to navigate too, I’ve bookmarked it in my favorites…. You seem to be making the right choice.. I would say stick to what you have decided. Though I have not used HTC desire but I like my Iphone a lot and i feel it cant get better. That is a great looking calender. I will download and use it for sure. Gonna download it.Thanks for the links, Calender looking very nice with detail of months. Love love love the colours in the longer exposure above… They are so vibrant! Very nice photograph. Impress your friends with this calendar. You can also do a lot of photography techniques with powered-packed and high-quality digital cameras. The artist of this image is very intelligent. He have very creative mind. This is not camera image. it is made in after effect, i think so. what you say? I have huge collection of calenders 2011.I download from different sites.Kingfisher calender is also very nice. I would like to know how many guys are waiting for new calender? i want to tell you i am keep watching new calender here or something new. I like your blog.Does anyone know the contact information for booking or buying Victoria Harbour Boat Trips for New Year's? Nice one Ken! I am almost ready to start writing some blog posts using Tobri, thanks for the reminder. the style of this one is astonishing! the colours are great and i luv the effects too… . I am glad i came here as i needed calendars, looking forward to the may one! I am glad to find a good platform that have more helpful suggestion on our needs. this is about photography, i could not find about you there. there is work and here is tips, how to do photography. Great title sharing all is very amazing telling that Download ADIDAP Calendar Feb 2011 now…..
this is is mostly, photography related blog, in this post have only feb calender. and nothing more, the how you can say that it is informative article. i agree that it is amazing calender. Where can we get the full calendar or is it available each month?